In December 1993, on my second trip to India to work at the National Institute of Hydrology, I met a colleague who confided to me that he was having trouble modeling a dam-breach failure1 using a well-known model. He mentioned that his results appeared to be off by a factor of two. I asked him what value of discharge coefficient was he using. I said: "You must be using SI units." To which he responded: "Of course." Then I said: "That is your problem. You are using a discharge coefficient applicable to U.S. customary units. You should be using the SI equivalent, which is roughly about one-half." 1 Ponce, V. M., A. Taher-Shamsi, and A. V. Shetty. (2003). Dam-breach flood wave propagation using dimensionless parameters. Journal of Hydraulic Engineering, ASCE, Vol. 129, No. 10, October, 777-782. 2 Chow, V. T. (1959). Open-channel hydraulics. McGraw-Hill, New York. 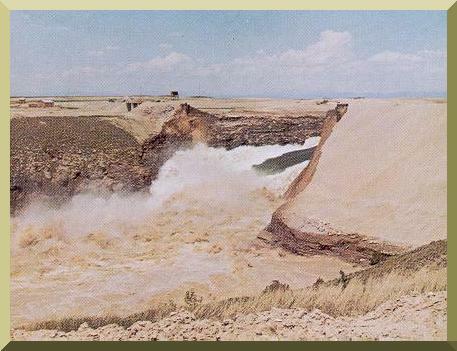 Failure of Teton Dam, on the Snake River, Idaho, on June 5, 1975 (USBR photo).